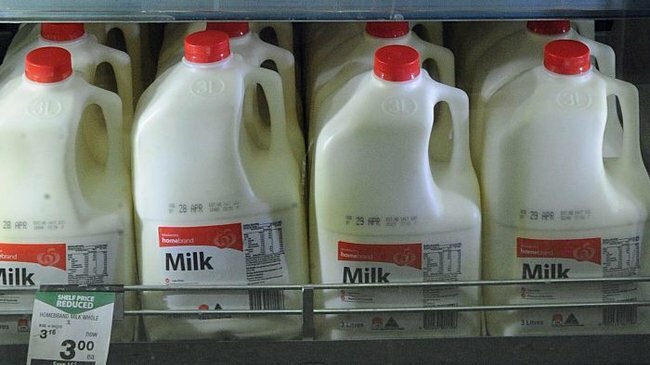 Cheap supermarket milk is being bought again. This is why. It was a movement that seemed to unite all Australians. Our dairy farmers were in trouble, and the call was put out to turn our backs on cheap supermarket milk and support local producers. But time has moved on, and data from Dairy Australia has revealed that while Woolworths-branded milk dropped from 66 per cent of sales to 51 per cent in a single month, its market share has now risen back up to just under 60 per cent. And when I heard the news this morning I wasn’t all that surprised. Because two weeks ago I also succumbed to the lure of cheap milk. So why did we start buying branded milk in the first place? QUT Associate Professor in Marketing Gary Mortimer says it all comes down to ethics. “So the milk thing is interesting, it talks about ethical consumption…” Dr Mortimer said. “We’re concerned about supporting local businesses — and in this case farmers — but the challenge with this brand stuff is this barrier between ethical intent and ethical behaviour. “Often what we see is we talk to the man in the street and they always say ‘we always want to support farmers … yes we want to support the little guy’. Tom Godfrey from consumer group CHOICE say it shows people do have the power to influence the market, even if briefly. “The temporary shift to purchase branded milk clearly demonstrates the power of consumer sentiment to drive change in markets,” he said. So why are we turning our backs on branded milk again? Dr Mortimer said the campaign against cheap milk was effective but short-lived. “A really good campaign was run by Dairy Farmers about buying branded milk and taking a photo of the milk case and the generic supermarket milk remaining on the shelf,” he said. “For a short period of time it had a massive moment and people moved away from the cheap milk. “The problem with the campaign, with those type of internal communication campaigns, is it has to stay new and it had to evolve and … it got old very quickly … because [it got] quite negative. “There was some really bad public relations incidents where people were abusing shoppers for buying the cheap milk so they just stopped promoting the story ‘buy the branded milk’. Victorian farmer Dianne Bowles had told ABC Rural that the support consumers gave through the branded milk drive was heartening, but Mr Godfrey said dairy farmers were still hurting. “I think many consumers cottoned on to the fact that paying a price premium for most branded milk doesn’t result in farmers being paid more,” Mr Godfrey said. “Rightly or wrongly, many consumers accepted the message that if you buy more expensive milk, then farmers will get a bigger pay check. He said a CHOICE investigation earlier in the year found that it wasn’t the $1 milks causing issues for dairy farmers, but a worldwide glut in dairy production and a drop in the farm gate milk price dairy farmers get for their product. “Depending on which branded milk product you purchased, paying a price premium may not have resulted in any direct benefit to farmers,” he said. “Although some struggling processors may have been given a slight boost, their financial fortunes largely rest with the international dairy market, not the price mums and dads pay for milk each week. “Supermarkets get their private label milk from the same big processors that sell some of Australia’s best-known milk brands. “Those processors pay dairy farmers the same price for their product regardless of where the milk goes — private label milk, branded milk, cheese or butter. So, if you want to actually help dairy farmers, which products do you buy? Don’t stop buying dairy products. Not everyone has room in the budget to buy organic milk from a local family-owned dairy. Do what you can and don’t feel guilty about buying private label milk. Every little bit counts.